Home /DO YOU WANT TO BE A POTTER? DO YOU WANT TO BE A POTTER? 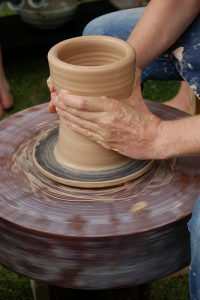 Pottery often referred to as ceramics is one of the oldest crafts in history. It is also one of the most satisfying, relaxing and magical skills one can acquire. The preparation of clay is a very laborious exercise but if you have clay in you neighborhood, it is a good experience to prepare your own clay; but there are many ceramic suppliers that offer good quality clay. You can use a rolling pin and a strong table to perform the same role as the slab roller until you are financially able to afford a commercial one. A glaze is a coating of liquid glaze and is the second most exciting part of ceramic production. The excitement of opening that kiln of glazed ware is unmatched. To gaze your production you need a kiln, wood, gas or electric, electric is the easiest to operate and you can purchase one that is automatic. Depending on your financial circumstances and cost of electricity or gas, you can fire or bake your production at different temperatures; earthen ware-low, stoneware-medium or porcelain –high.